75 Liter Willow Internal Frame Pack Graphite | BUDK.com - Knives & Swords At The Lowest Prices! Holding up to 55 lbs., this 75-liter pack frame provides stability and mirrors your torso movement when you're on the go. The breathable foam back is comfortable, cushioning heavy loads and allowing air to pass through and keep you cool. 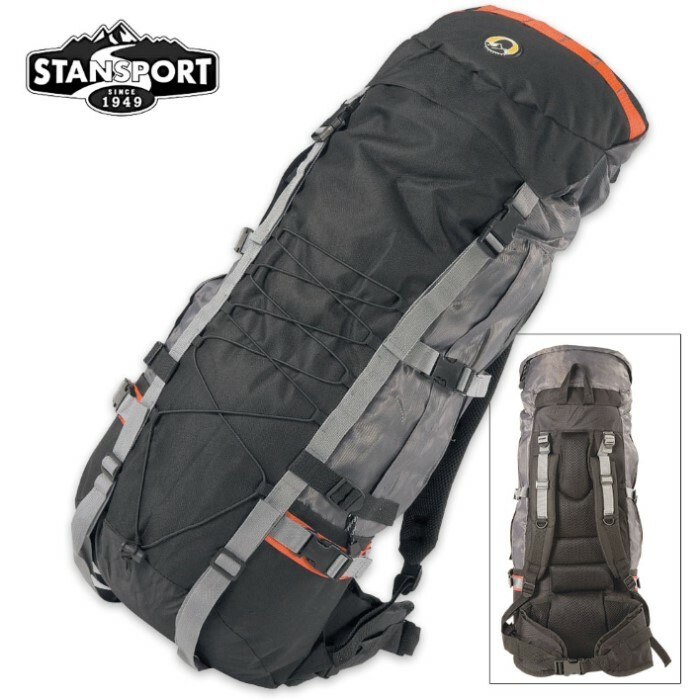 The durable 600D polyester fabric is abrasion resistant and features multiple pockets, zippers and gussets for organization, and the multiple loops, straps and side compression straps allow you to attach all your gear securely to the pack. The convenience factors and value of this pack make it a must-have for on-the-go outdoor enthusiasts. Backpack is a top loader, just under 7 pound, stiff fabric feel. I was able to tie on a sleeping pad and a bivy bag on the outside. I guess I had a good 50 pounds it said 53 pounds on the scale. I am 5 foot four, 142 pounds. and short but very wide torso and small hips. Fit well. Not super comfortable, but the internal frame, I believe, made it hold less equipment than I needed for weeks of camping. I was able to attach a bulky sleeping pad to the outside. It was quite warm for Spring and early summer. Its going to be hot for summer. Kind of why I like external frames. Its a carbon light gray color. Not a screaming loud bag. I like a quiet looking big back pack, because if you have to enter a store to get food, its not like hey I am homeless/ However, because of the material, its heavier than ripstop and hard to clean. However, compared to most packs this volume, it is more inexpensive and made much better.